*The manufacturer strongly recommends that you use a GFCI with any electric tool around water for your safety. First, fill your Grit Guard Pad Washer with water until it is 1/4-1/2 inch above the radial grid when it is fully pressed down. It is important not to overfill the pad washer. After you have done this add 1 oz. 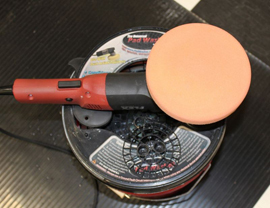 of McKee's 37 Polishing Pad Rejuvenator into the solution. With the used pad on the polisher, press the pad against the Grit Guard radial surface inside the pad washer. Close the Splash Guard to keep the water inside the pad washer. Turn the FLEX 3401 on at a speed of 1-2 and hold it against the grid surface, pressing down to pump more water up towards the pad. Run the pad inside the pad washer for 10 seconds to wet it. Turn the polisher off and withdraw it from the pad washer. Place the pad, which is still on the polisher, back into the pad washer and close the Splash Guard. Turn the polisher on at its lowest speed setting for 10-20 seconds. 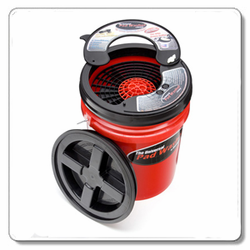 Move the polisher all around inside the bucket to make sure all parts of the pad are cleaned. You can increase the speed of your polisher, but never let it exceed more than 25% of its maximum speed setting. For more agitation, run the pad against the Grit Guard Extension to target heavily soiled areas. The Grit Guard Insert agitates the pad to remove polish as it spins inside the Grit Guard Universal Pad Washer. To dry the pad, raise the polisher slightly off the Grit Guard Insert, with the Splash Guard still closed, and spin out the excess moisture at a higher speed. For a more advanced drying technique, place the Grit Guard Extension on the outside of the pad washer where it says, "Dry Pad Here." 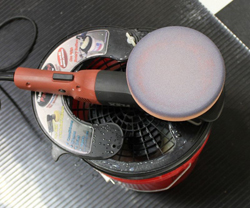 Operate the polisher at a higher speed setting to remove the excess water. * Avoid getting the pad backing wet. There is no need to submerge the whole pad. The polisher should always be out of the water and the hook and loop backing should stay dry. McKee's 37 Polishing Pad Rejuvenator 16 oz.